Ghared Boyce and Everett have been unstoppable offensively thus far. Photo courtesy of ESPN Boston and Brendan C. Hall. 1. Cambridge (2-0; Last Ranking – 1): While Concord-Carlisle gave the Falcons a scare on opening night, Lance Dottin scared some defense into his squad, as they dominated Westford Academy for a 70-28 win in their second game of the season. 2. BC High (2-0; Last Ranking – 2): The Eagles faced two quality opponents in Needham and Brockton to open the year, and won both games handily. 3. New Mission (3-1; Last Ranking – 3): Just like last season, the Titans destroyed City League rival Charlestown, but required overtime to defeat pesky Boston Cathedral two nights later. New Mission also lost, 74-70, to out-of-state foe Windsor (CT) in between those conference games. 4. Mansfield (2-0; Last Ranking – 5): Hornets had no trouble with Hockomock League riser Foxboro on opening night, and won at Canton last Friday. Now this talented team will test its mettle with a two-game road trip to Florida scheduled over Holiday break. 5. Catholic Memorial (2-0; Last Ranking – 6): Say what you will about the competition thus far, but the Knights still looked like a powerhouse with decisive wins over Wachusett (74-47) and New Bedford (86-59). 6. Franklin (2-0; Last Ranking – 7): Connor Peterson led the Panthers to a 21-point win over North Attleboro on opening night and a 63-54 win at Milford to open the season. 7. Everett (3-0; Last Ranking – 9): Ghared Boyce and company have been on fire offensively, dropping 80-plus points in three wins over Saugus, Lynn Classical and Salem to begin the season. 8. Springfield Putnam (1-0; Last Ranking – 10): No issues for the Beavers in an out-of-state clash with Narragansett (RI) to begin their season. 9. Brighton (1-0; Last Ranking – 14): Perhaps motivated by not getting mentioned in our “Players to Watch” article, or Brighton’s preseason blurb, senior guard Tyrone Perry went off for 30 points, 11 rebounds, 7 assists, 3 blocks and 3 steals to become a 1,000-point scorer in the Bengals' blowout win over West Roxbury. 10. St. John’s Prep (2-0; Last Ranking – 12): Eagles lost a lot with several key players graduating and transferring after a disappointing 2015-16 season, but they should be right in the mix in the tough Catholic Conference. 11. 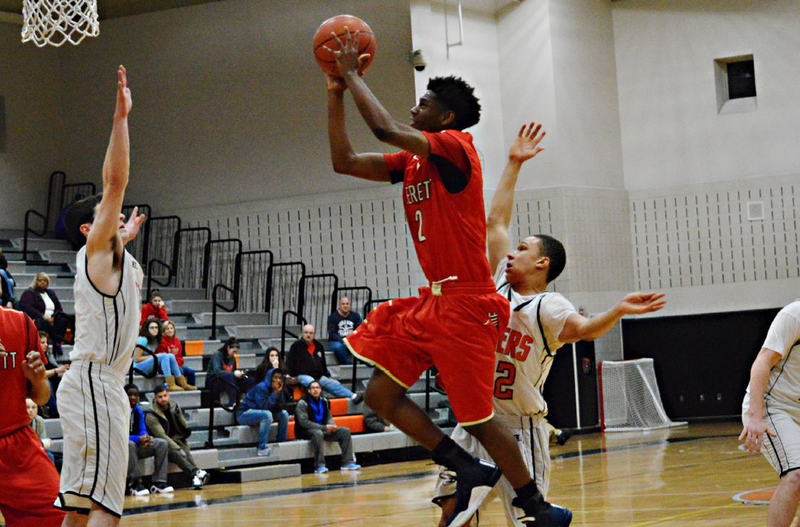 Newton North (1-0; Last Ranking – 4): It appears these Tigers will have some growing pains, as Newton North blew a six-point lead in the final minute of a 65-63 loss at Milton last Friday. 12. Marlborough (2-0; Last Ranking – 13): Panthers met more resistance during a trip to Shepherd Hill Regional last Friday, but Chris Doherty and company still held on for a 62-57 victory. 13. Central Catholic (1-0; Last Ranking – 15): The Raiders are still flush with talent, despite losing both Kevin Fernandez and Tanahj Pettway this offseason. They’ll look to hold serve against New Hampshire schools during the school’s Annual Holiday Tournament. 14. Lowell (1-0; Last Ranking – 21): Bob Michalzcyk didn’t win ESPNBoston’s Coach of the Year Award by accident last season, and he certainly had the Red Raiders ready to play in an opening night win over Andover. 15. St. John’s (Shrewsbury) (3-1; Last Ranking – 11): After rolling to three good wins to open the season, the Pioneers were stunned by Nashoba in a 61-55 loss at home last Friday. 16. Needham (1-1; Last Ranking – 8): Thomas Shaughnessy had an off night in a blowout loss to BC High last Tuesday, but bounced back along with the rest of the Rockets to down Natick. 17. Malden Catholic (3-0; Last Ranking – 16): Lancers stayed hot this week with wins over Winthrop and Greater Lawrence. They’re off until December 27, when they’ll face Franklin at a neutral site. 18. St. Mary’s (Lynn) (2-1; Last Ranking – 18): The Spartans couldn’t handle D2 power New Mission, but they proved that they’re still the class of the Catholic Central League with big wins over Archbishop Williams and Arlington Catholic. 19. Brookline (2-0; Last Ranking – NA): The emergence of sophomore stud Chris Camille is vaulting Brookline into the ranks of true contenders in D1 South. He’ll look to lead the Warriors in a tough home test against conference rival Braintree this Tuesday. 20. Concord-Carlisle (0-1; Last Ranking – 20): Despite starting the season with a loss, the Patriots stay put in our rankings after an excellent showing against the reigning D1 champions at Cambridge. 21. Braintree (1-0; Last Ranking – NA): Nick Timberlake picked up where he left off with a great game during Braintree’s 81-60 win over Norwood to open the season. 22. Boston Cathedral (2-1; Last Ranking – NA): While they couldn’t quite hang on to stun New Mission on Sunday night, the Panthers looked quite impressive against a premier D2 program. 23. Maynard (1-0; Last Ranking – 23): Tigers won rather easily at Littleton, and they should roll through their upcoming schedule before getting a crack at Marlborough next month. 24. Malden (2-0; Last Ranking – NA): After pasting Tewksbury, 64-47, to open the season on an impressive note, the Golden Tornadoes held on to defeat Marblehead 56-51 last Saturday. 25. O’Bryant (2-0; Last Ranking – NA): Rivaldo Soares is a name to watch in the Boston City League, and he’ll look to lead the Tigers in a big test against Brighton this week.